My whole life has been shaped by the collective memory of what I think my life was like. That is to say that I, like all of us, am reliant on my memories to narrate my ever-developing biography. Many of our day-to-day moments go unrecorded save for the bits of information that are automatically and irrepressibly stored at the instant of occurrence. Those bits of information assemble a 4-dimensional snapshot containing images, sounds, smells and emotions specific to that very moment or event. These snapshots are indexed in relation to those before and have hooks for which future shots will be linked. The whole lot of them continually grows into the matrix that defines our lives until our last day when our array draws to an abrupt halt. This ever-growing crystal is the id by which we are ultimately defined. Even as we try to escape the ills of our pasts, to live in the right now and think only of tomorrow, we trudge forward with a train of ten thousand boxcars loaded with the experiences, images, joys and sorrows from a lifetime of triumphs and failures trailing behind. No matter how much baggage we offload or how many volumes of cargo we've lost the ability to recall, the train still rolls. It rolls, and grows with each new day and each new experience. In today's terms, imagine each boxcar is a hard drive filled to capacity before tethering onto it another, and another.... and another. Each indexed differently with fragmented files spanning several drives, few having similar or even compatible formats. Day after day we deliberately task our brain-butler to summon information from our annals, bringing forth the name of our favorite Thai place, directions to the Cineplex or the twelve digit half alpha/half numeric - half upper case/half lower case passwords needed to survive in the 21st century. Every so often, random and assumed to be forgotten info unexpectedly drops right into your foremost thought. Your high school locker combination, the name of that kid that always got poison ivy, the colors of the beware of dog sign that emblazoned your childhood home's front gate. All irrelevant now but ever so freshly recalled. Some of these bits of hard data come with waves of feelings and emotions. Maybe a chill or a sensation of excitement or embarrassment accompanies the memory of your first kiss. Perhaps another memory sends a quick sharp stinger down to the ankle you twisted under your bike while attempting to do something stupid. Perhaps you feel stupid all over again. Some thoughts are there for us to draw forth on demand. Others we cannot seem to rekindle with even the voice of a thousand sirens. And others still just fall out of nowhere to grant us an episodic encore that jars us into remembrance of who we are. I had the pleasure of experiencing the latter one afternoon nearly ten years ago. It was summer or late spring, (that part I don't remember). I was driving with my window down when a 60's era Chevy truck changed into my lane. The wafting air whirled through my car and I was overcome by the memory of my father's old car of a similar vintage. 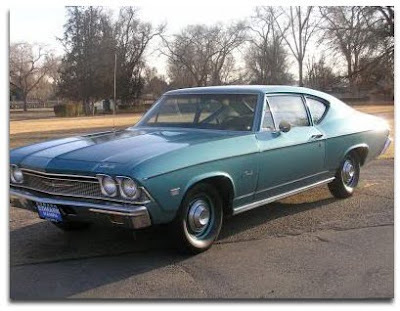 It was the combination of rusting steel, aged leather and vinyl, musty carpeting, polystyrene foam and a lean gasoline mixture that was an identical olfactory match to my father's 1968 Chevelle. I immediately recognized it as if I myself was in the driver's seat taking my first drivers test. It was my parents’ first new car, purchased just weeks after I was born. It was a beautiful metallic Tripoli Turquoise. I remember many days of sitting in the back on the ribbed vinyl seat, clear of the hump, strapped in with black pushbutton lap belts. I can still conjure up the sound that the buckles made when fastening and when being released. I even have associative feelings of joy that went with arriving at a destination and releasing the safety belt latch. The doors closed with a "creak", followed by a stout "thump". The way my father drove combined with the slack recoil on the brake pedal provided a unique and distinctive sound that emanated from the front seat. When releasing the brake, he slid his foot off rather than lifting it. This released the pedal with a snap that "bounced" it back into place. That rhythm along with the air that whistled through the front vent windows over the roar of the small block 327 cid V8 provided the soundtrack for this particular memory. On long trips my father fancied strengthening his free hand with one of those spring loaded squeezer things that he kept in the front seat at all times. Thinking of the sound it made brings back memories of how the diamond cut plastic handles dug into my tender youthful palms and how it took me two hands to squeeze the two handles far enough to touch tip to tip, and if I didn't position it just right it would spring out of my hand nearly taking a finger with it. Yes... these were the elusive and proverbial "good ol' days". At least that's what my id was telling me that very moment when the air from that speeding Chevy drifted on the wind into my open windows on that otherwise forgettable summer afternoon. I got a whiff of history that was so pungent that I still can recall not only that moment but the lore of that car, my childhood, my family and my father. That car that sped by me smelled like my father's car, which I identified with my father. On further thought...that car... that car smelled like me.